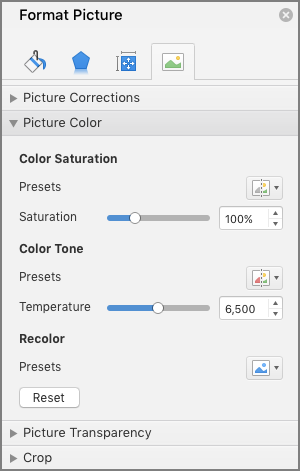 You can adjust the color intensity (saturation) and color tone (temperature) of a picture, recolor it, or change the transparency of one of its colors. You can apply multiple color effects to your picture. Saturation is the intensity of the color. A higher saturation makes a picture look more vivid, whereas a lower saturation makes the colors look more grey. The Format Picture pane appears. On the Format Picture pane, click . Click Picture Color to expand it. Under Color Saturation, move the saturation slider as necessary, or enter a number in the box next to the slider. When color temperatures are not measured correctly by a camera, a color cast (too much of one color dominating the picture) can appear on the picture, making the picture look too blue or too orange. You can adjust this by increasing or decreasing the color temperature to enhance the details of the picture and make the picture look better. Under Color Temperature, move the temperature slider as necessary, or enter a number in the box next to the slider. You can quickly apply a built-in stylized effect, such as grayscale or sepia tone, to your picture. Under Recolor, click any of the available presets. If you want to switch back to the original picture color, click Reset. You can make part of a picture transparent to better show text that is layered on top of it, to layer pictures on top of each other, or to remove or hide part of a picture for emphasis. Transparent areas in pictures are the same color as the paper on which they are printed. In an electronic display, such as a Web page, transparent areas are the same color as the background. Click Picture Transparency to expand it. You can either apply one of the presets, move the transparency slider, or enter a number in the box next to the slider. Click the picture that you want to change the color intensity for, and then click the Format Picture tab. Under Adjust, click Recolor, and then under Color Saturation, click the one that you want. To fine tune the color intensity, click Recolor, and then click Picture Color Options. Under Color, move the Saturation slider, or enter a number in the box next to the slider. Click the picture that you want to change the color tone for, and then click the Format Picture tab. Under Adjust, click Recolor, and then under Color Tone, click the one that you want. To fine tune the color tone, click Recolor, and then click Picture Color Options. Under Color, move the Temperature slider, or enter a number in the box next to the slider. Click the picture that you want to change the color for, and then click the Format Picture tab. Under Adjust, click Recolor, and then under Recolor, click the one that you want. 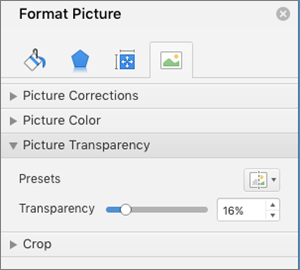 Click the picture that you want to change the transparency of a color for, and then click the Format Picture tab. Under Adjust, click Recolor, click Set Transparent Color, and then click the color in the picture or image that you want to make transparent. Note: You cannot make more than one color in a picture transparent. Areas that appear to be a single color (for example, blue sky) might actually be made up of a range of subtle color variations. Therefore, the color that you select might appear in only a small area. This is why it might be difficult to see the transparent effect.